The onslaught against FREE speech takes many twists and turns. Sometimes it is in Government legislation as AltNewsMedia revealed here. Sometimes it is in something as relatively mundane as a local Council election. 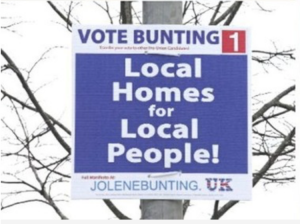 The fake news media has been faithfully parroting that the elections posters of Independent Unionist Jolene Bunting have been reported to the Police. 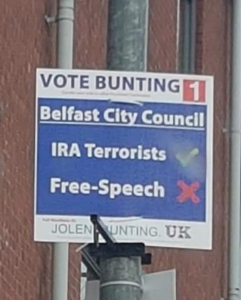 Here is a selection of some of the posters that Independent Unionist Councillor Jolene Bunting has placed in her Council ward. 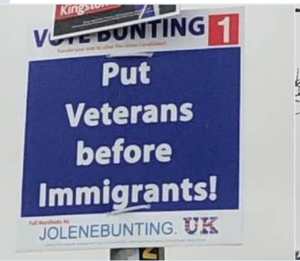 Sinn Féin councillor Ciaran Beattie described the posters as the “politics of hate”, while Alliance representative Micky Murray branded them “blatant, everyday racism”. Leaving aside for one moment the very notion of the IRA’s political proxies in Sinn Fein lecturing anybody about “hate speech”, or the whining of the alleged “liberals” in the Alliance Party seeking to suggest it is “racist” to prioritise veterans before immigrants, there is a fundamental issue here concerning freedom of speech. If no offence has been detected, as he confirms, then WHY are the Police wasting finite resource investigating non-crime? What business is it of the Police which political messages political candidates place on their posters so long as they are lawful? Surely there are plenty of unsolved murders and other heinous crimes to solve in Belfast? AltNewsMedia spoke exclusively with Councillor Bunting to hear her side of the argument. 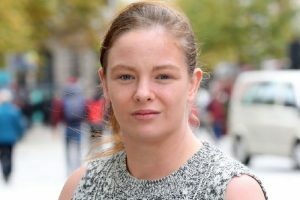 Councillor Bunting says she has been receiving favourable feedback from people on the ground as she conducts her canvas ahead of the May elections and as she puts it -if her policies were all implemented, would they make peoples lives better or worse? Have we reached the point where policies that are unacceptable to some groups cannot be put to all of the people? Is free speech for some, but not for all? Have we fallen this low?